As an engineer, something in the news recently was immediately relatable. An Atlanta doctor recently experienced what many female and minority professionals do: skepticism that they could possibly what they claim to be. According to the story, she tried to tell the flight attendant several times that she was a real physician. The attendant’s skepticism would not be appeased. Instead, she was willing to take the word of a male passenger who claimed to be a doctor, as well. Is she a “Real” Doctor? Part of this story is routine. I once was on a flight with a relative who’s an ICU nurse, and she happened to be the only person to respond when the flight crew asked for medical assistance. An attendant came over, asked what kind of medical professional she is. He asked if she had her work ID or some other sort of credential, and away they went. However, at no time was she disrespected. The crew was relieved that there was anyone at all who could help. At the end of the flight, the pilots invited her into the cockpit, and the crew did a great job of re-stating their appreciation. 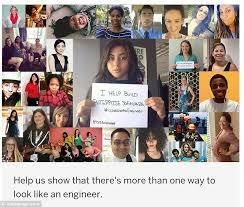 Not too long ago, a tech company ran an advertisement featuring one of their female engineers. In an age of stock photos, it’s not unexpected that a company doesn’t use real employees in their ads. However, the reaction was so strong, that the woman in question took to social media to re-assert, that indeed, she was an engineer, not a model. As an engineer myself, skepticism has been a fact of life for me for most of my career. Whether it’s in the workplace or at conferences, there is still a glaring lack of diversity in the workplace. I’ve had my share of experiences of advocating for a certain direction, and the decision maker wouldn’t budge. But as soon as someone else, usually a man, advocated for the same thing, all of a sudden, it was adopted. I’ve also had my share of men trying to take credit for my work, even when my “fingerprints,” so to speak, were all over it. In one instance, someone much higher up the food chain tried to take credit for my work. I happened to find out because I insisted on attending a particular meeting, and someone brought it up. I watched, almost aghast, as my usurper said, “the team is going to do this and that”. All the while, he never acknowledged me, a few seats away. The person asking the question wasn’t satisfied; he wanted to know more. That opened up the perfect opportunity for me to speak up, and re-assure the stakeholders that this is a signature process that I’ve used at many past employers and clients before. There was no need to shout from the rooftops that someone else was trying to take my credit – it was clear that’s what they were trying to do. We keep saying it’s 2016; why does XYZ continue to happen? Well, it’s the world in which we live. Women and minorities, for all our accomplishments, are always having to prove ourselves over and over again. Am I emotionally and intellectually resilient enough to take it in stride? Of course. But sometimes it’s nice to be taken at our word. Copyright 2018 Kareen Kircher. All Rights Reserved Worldwide.